– 2/2 James Kirkland suffered a broken nose forcing the cancellation of his fight against Ring Mag #4 Jr Middleweight Miguel Cotto. The fight was scheduled to take place on Feb 25th at the Force Center at the Star in Frisco, Tx. The entire card was cancelled, also resulting in the cancellation of Ring Mag #7 lb for lb, #1 Jr featherweight & WBA champ Guillermo Rigondeaux making the 8th defense of his title against #6 rated Moises Flores. – Ring mag #8 lightweight Felix Verdejo won a tougher than expected 10 rd UD over unrated Oliver Flores on Feb 3rd at Coliseo Roberto Clemente, in San Juan PR. Verdejo started strong, but couldn’t finish off Flores, who was stopped in 3 rds by Ring Mag #7 Jr Lightweight Takashi Uchiyama last Dec in his last fight. Flores was the stronger fighter down the stretch as Verdejo appeared to fade badly. This was Verdejo’s 1st fight since his serious motorcycle accident last Aug that left him hospitalized for 5 days. He’s not been taken the distance in 4 of his last 6 fights. Next up is supposedly a clash with Ring Mag #2 & WBO Lightweight champ Terry Flanagan in June. – Ring mag #6 Middleweight Chris Eubank Jr went up to Super Middleweight & stopped unrated Renold Quinlan at 2:07 of the 10th rd on Feb 4th at Olympia in Kensington, London. Quinlan took many hard shots as the referee waved off the bout. Eubank trained himself for the fight & since his lone loss in Nov. ’14, has now won 6 straight, all by stoppage. – Ring Mag #10 Flyweight Daigo Higa stopped unrated Diomel Diocos at 2:29 of the 3rd rd on Feb 4th at Korakuen Hall in Tokyo, Japan. Higa was never in trouble & dominated the action. He remained undefeated in 12 fights with all his wins coming by way of knockout. – Ring Mag #9 Jr Flyweight Hekkie Budler won by 8th rd TKO over unrated Straweight Joey Canoy on Feb 4th at the Emperors Palace in Kempton Park, Gauteng, South Africa, when Canoy remained on his stool at the start of the round. Budler has now won 2 straight since his 1st loss when he lost the WBA Straweight Title by 12 rd UD vs Byron Rojas last March. – 2/7 Opening statements for the civil trial brought on by Ring Mag #2 Heavyweight & WBC Champ Deontay Wilder against Alexander Povetkin began today. The suit stems from Povetkin failing a WADA administered drug test, cancelling their fight six days before it was to take place, which was scheduled for May 21st in Moscow. Wilder is seeking $5M in damages for the lost fight. – Ring Mag #3 Lightweight & IBF Champ Robert Easter successfully defended his title for the 1st time with a 12 rd UD over unrated Luis Cruz on Feb 10th at the Huntington Center in Toledo, Oh. Easter scored knockdowns in the 10th, 11th & 12th rounds as he was in control throughout. He’s now gone the distance in B2B fights after 5 str KO’s. Cruz was totally undeserving of a title shot as he hadn’t beaten an opponent with less than 15 losses since 2011! Totally undeserving title shot. – On the undercard of Easter/Cruz, unrated Zhanat Zhakiyanov won a 12 rd SD over Ring Mag #2 Bantamweight & WBA Champ Rau’Shee Warren by the scores of 116-110, 115-111 & 111-115. Warren was making the 1st defense of his title that he won last June and scored 2 knockdowns in the opening round. Zhakiyanov appeared to score a knockdown in the 3rd round, but ref Gary Rosato ruled a slip. Zhakiyanov controlled the fight the remainder of the way. This was his 1st fight in over a year & he’s won 22 str since his lone loss in ’08. Warren, a 4.5:1 fav, has now lost 2 of 3. – Ring Mag #6 Jr Welterweight Regis “Rougarou” Prograis scored a 1st rd TKO over unrated Wilfrido Buelvas on Feb 11th at the Hard Rock Hotel & Casino in Biloxi, Miss. Prograis has stopped 12 of his last 13 foes, including 4 straight. Buelvas came in 7 pounds overweight for the fight. – 2/13 Ring Mag #2 Heavyweight & WBC Champion Deontay Wilder won an approximate $5.5 Million dollar lawsuit over Alexander Povetkin. The suit stems from Povetkin failing a WADA administered drug test, cancelling their fight six days before it was to take place, which was scheduled for May 21st 2015 in Moscow. Wilder & his promoter Lou Dibella filed the suit seeking lost damages. – 2/16 Ring Mag #2 Jr Middleweight & IBF Champion Jermall Charlo has vacated his IBF title as he is moving up to the Middleweight division. 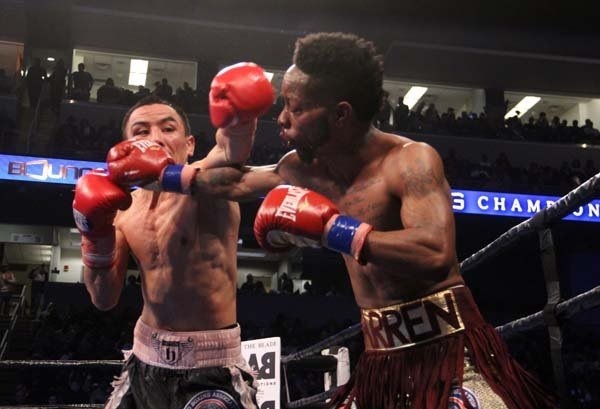 – Adrien Broner won a 10 rd SD over Ring Mag #4 Jr Welterweight Adrian Granados on Feb 18th in Cincinnati, Oh. The fight featured a lot of clenching and holding and neither fighter was knocked down or seriously hurt. Broner has now won six of seven including three straight. The fight was assumed to be fought at 140 pounds, but then it was reported the fight would be at 142 pounds. A week before the contest, however, it was announced that Broner needed the weight to be increased to 147 pounds, which Granados agreed to because he didn’t want to miss the opportunity for the fight. Broner was rated by the Ring Mag as the #2 Jr Welterweight when the fight was announced, but come fight time, had been dropped in the ratings. – Ring Mag #4 Light Heavyweight Eleider Alvarez stopped unrated Lucian Bute at 2:22 of the 5th rd on Feb 24th at Centre Videotron in Quebec City, Quebec Canada. Bute was in control early, but two right crosses to the head by Alvarez dropped Bute for the count. This was Alvarez’s first stoppage win in 5 fights. He’s now the mandatory challenger for Ring Mag #3 & WBC Champ Adonis Stevenson. – Ring Mag #2 & WBC heavyweight champ Deontay Wilder successfully defended his title for the 5th time when he stopped unrated Gerald Washington at 1:45 of the 5th rd. Washington controlled the fight early, but there was little action as Wilder offered little offense. A short right cross dropped Washington in the 5th and after rising Wilder threw several haymakers, none landing solidly, however the referee stepped between the two and called off the fight. Washington was on unsteady legs when the ref intervened. Wilder has now stopped 5 straight opponents. This was Washington’s first defeat. Originally Wilder was set to defend against unrated & 60:1 ‘dog Andrzej Wawrzyk, until he tested positive for steroids in Jan.
– On the undercard of Wilder/Washington Ring Mag #9 Jr Middleweight Jarrett Hurd won the vacant IBF Title after stopping unrated Tony Harrison at 2:24 of the 9th rd. Harrison controlled the fight early with Hurd’s aggressive style beginning to take over in the middle rounds. A right hand upstairs dropped Harrison and after rising before the count, he spit out his mouthpiece indicating he wanted no more. Hurd has now stopped 8 of his last 9 foes including 6 straight. – Ring Mag #4 Jr Featherweight Rey Vargas won the vacant WBC title after winning a 12 rd majority decision over unrated Gavin McDonnell on Feb 25th at the Hull Ice Arena in Hull, England. The scores were 117-111, 116-112 & the lone British judge turned in an eyebrow raising 114-114 card. The undefeated Vargas is now a World Champion for the 1st time. It was the 1st loss for McDonnell.